A few weeks ago, I flew to Washington state for a three-day haiku conference. When I first attended the Seabeck Haiku Gathering a year ago, I was fairly new to the whole world of haiku, and it was very exciting to meet other serious haiku poets for the first time (see Finding My Tribe). This year, the conference deepened and expanded my understanding of this deceptively simple art form. Circling back to the same place a year later, I was also able to see how I have progressed as a poet and artist since then. I was happy to be invited to do a poetry reading and present a digital slide show of my art, including the seashell painting at the top of this page. Following are a few of the conference activities, followed by my haiku. 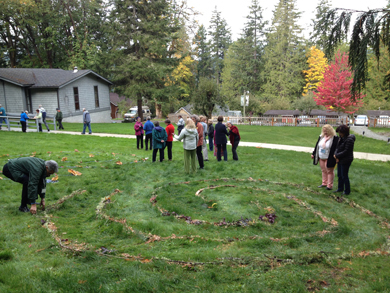 The first morning, author and teacher Margaret McGee had us create large spiral labyrinths made of branches, autumn leaves, and oyster shells. She then led us on a contemplative walk into and out of the spirals, and over the weekend we dotted them with our haiku. spiral labyrinth . . .
Terry Ann Carter, the president of Haiku Canada, led a workshop based on nature essays by Canadian writer and painter Emily Carr. Jacqueline Pearce, the author of several historical novels for children and teens, gave a talk called “Time Travel with Haiku,” where we wrote historical haiku as well as “scifaiku” about the imagined future. Poet Alice Frampton led the group on a forest hike to the historic Seabeck cemetery, which inspired many poems. There was much more besides, including haiku bingo, a talent show, presentations by haiku poet Marco Fraticelli, and anonymous haiku workshops. On the last day, cartoonist-in-residence Jessica Tremblay of Old Pond Comics delightfully summarized the whole Seabeck gathering in cartoon form. As with the labyrinths we made, the Seabeck conference left me reflecting that progress is rarely linear. It’s more like a spiral, where we repeat certain actions and experiences over and over, hopefully improving a little bit on each pass. The challenge is to stop looking for shortcuts, take a few breaths, and just enjoy the journey. My thanks to Seabeck organizers Michael Dylan Welch and Angela Terry of Haiku Northwest for this fun and inspiring gathering, and to all the other participants who made it such a warm and rich experience. “listen—the song” is 5" x 7", painted with sumi ink and Japanese watercolors (gansai paint) on heavy textured paper. It is also available as a print or greeting card. Poetry & Honey: A new 2014 wall calendar features 12 of my paintings. This mini-calendar is now available online and at selected Humboldt County stores. Arts Alive Holiday Show: I will have several pieces in a group show at the Mateel Cooperative Gallery, 773 Redwood Drive, Garberville, CA in December.